Services in the euro zone posted a rise in August for the first time in 19 months and manufacturing remained in expansion mood for the second straight month. That helped the euro overturn an early slump versus the dollar, closing rather flat at $1.3355. The ongoing indication that the US economy is strengthening was reinforced by better-than-expected existing home sales data. That supported a rally in the dollar versus the shared currency which was accentuated by the FOMC minutes later on. This encouraged a steady fall throughout the day for the EUR/USD CFD pair, which dropped 63 points to close at $1.3355. The euro-dollar rate surged 81 points yesterday, supported by news that the European economy is recovering and finally emerging from a record long recession. In particular, the construction industry climbed for a third month, led by Germany. Another catalyst for the euro's rally might have been some capital outflows from emerging markets which are not enjoying the best of times. By and large, it was a calm day for the euro yesterday, with the single currency finishing rather flat versus the dollar at $1.3334. However, with Germany, Europe's biggest economy, apparently starting to gather speed, this could provide some good support. On the other hand, market participants will probably want to wait for additional clues from the Fed before placing any new bets in the currency space. Following Thursday's sharp rally, the euro pulled back 15 points to $1.3333 as FX traders took some profits ahead of the weekend. Whilst the European economy appears to have emerged out of recession, the Fed's timing on tapering is still anybody's guess. Maybe the minutes of the latest FOMC meeting will provide a few extra hints later in the week. Sorry, there is no forex market commentary for today. Euro-dollar did very little yesterday and ended up closing flat at $1.3260 after trading within a 40 point daily range. Despite the Eurozone breaking free from recession, the euro struggled to move higher. Nevertheless, in this morning's early trading, there has been a move to the upside after a Fed President warned policy makers about changing course based solely on economic forecasts. The currency pair is now trading some 40 points higher. The dollar strengthened against the euro yesterday, with the pair generally ignoring the data releases and trading lower on continued talk of Fed tapering plans. European data was generally better-than-expected but the countering speculation proved a stronger influence. As a result, the euro-dollar spread betting market dropped about 30 points to close at $1.3260. The euro/dollar market had a quiet session yesterday with eyes looking to today's Retail sales data. Strong numbers should result in the dollar being bought as the case for a reduction of Fed asset purchases continues. Yesterday the pair closed at $1.3290. 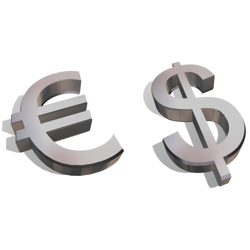 The recent upward trend in the euro-dollar market was bucked on Friday. An expected gain in the French industrial production numbers actually came out as a 1.4% fall, igniting fresh fears about the state of the Eurozone and leading to a de-valuation of the single currency. The pair fell by 40 points to close around the $1.3340 level.